Words by Kevin Doocey on August 29, 2009 . Sitting here in an internet cafe in the Algarve, the weather is almost too hot for comfort, so, I’ve decided to muster up an article or two. 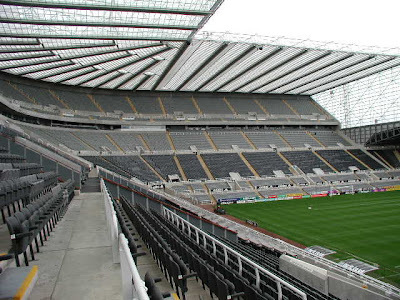 While I’ve been away it seems there’s been a lot of talk and not much action per usual, but the good news that greeted me today, was reports that the firesale had ended at Newcastle United, and that’s very good news, to say the least. The bad news though, is the injuries that have struck, we knew that they were coming and that it was only a matter of time but now they have hit perhaps our two best players at the minute, Shola Ameobi and Jonas Gutierrez. The reports are, that both could be our for up to a month and knowing the Championship campaign and strenuous demands, we need as many players as we can get. Gareth Bale was supposedly coming but that seems still in the works for manager Chris Hughton. Regards the takeover, it seems that Barry Moat’s bid for the club is fading each day. Now it seems Geoff Sheard leading an American consortium to buy the club, could turn out like an accurate report. “The Americans are pushing like hell to get a deal through. “They arrived in London late yesterday and will speak to Seymour Pierce once again. “It’s at a critical stage and they don’t want to say too much. it would be very good if it happens but will Ashley agree to it. I don't think so, hope I am wrong!